We LOVE receiving updates from families that have come home. Not only is it incredible to see how far a child can come in a short amount of time with the love and support of a family, but it’s a great reminder that adoption is so much more than the process we help families through each and every day. Lena Yi Yi will be 19 on March 28th. It goes fast when you adopt them at an older age. Overall we have had a smooth ‘older child’ adoption. Knowing that she bonded with her Chinese adopted family from very early infancy I know helped. She’s very much fit into our family. She is actually so much like her dad in so many ways that except for her appearance one would not know she’s not our biological child. She is still home-schooled and will graduate either in late May or early August depending on how fast she completes her work. She speaks English well but still struggles with reading and writing English although it’s improving slowly but surely. She is also still 100% fluent in Chinese. I had her take one semester with a native Chinese teacher, who immigrated to the US from China and settled in Nevada. This woman is a certified teacher and the super advanced Chinese lessons were via Skype. The teacher said Lena was very intelligent and read quite well and grasped new concepts in advanced Chinese very quickly. 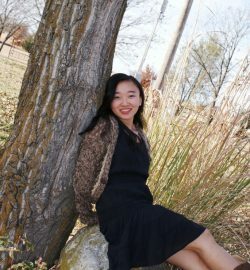 Lena Yi Yi’s goals after graduation range from continuing to improve in English so she can work as a translator, to being a missionary and work in orphanages all over the world, and to continue training in dance and work in a Christian ballet company. She is applying to be a part of Wichita State University’s International Intensive English program. Although she’s a US citizen and this program is normally for international students, they do occasionally work with US citizen’s where English isn’t their first language. Regardless of all of her other goals, Brad and I agree this would give her a huge boost in anything she tries to do in life. 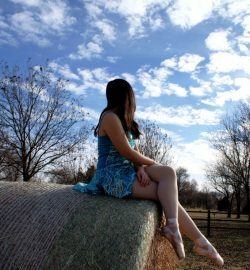 Speaking of dance, this has been Lena Yi Yi’s passion her entire time here. 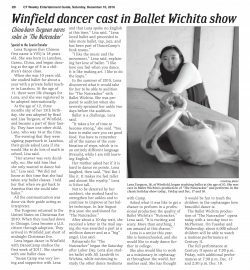 Ballet is her favorite although she has also trained in jazz, tap, contemporary, and has been a part of a studio ‘funk team’ and was selected to be a part of a competitive dance team in Wichita. 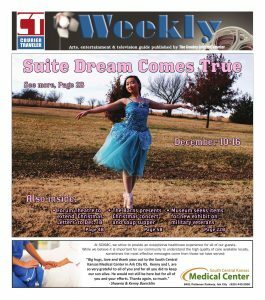 This year she was chosen to be a part of the Nutcracker in Wichita. I am sending an article that ran in our small town newspaper about that. I am also sending some pictures and Facebook stories. I feel her story is a good one to share as I know many with older child adoption have had struggles. We are thankful for all the help we had at Great Wall as well as that things really have gone pretty smoothly for us. If your family is interested in learning how you can adopt an older child through China’s Waiting Child adoption program, visit GWCA’s Waiting Child photo listing or contact our matching specialists today! Share YOUR Story with GWCA today by sending it to ana@gwca.org!